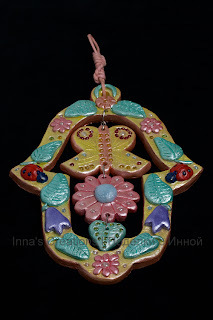 I had been planing to make a new hamsa for a long time, and eventually made this one for my mother-in-law's birthday. In my opinion, a hand-made hamsa makes a perfect gift. It's pretty easy to make a hamsa of this type, and I'm going to tell about this in detail. 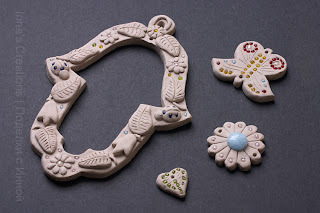 As usual, I used Keramikal clay, but I suppose any polymer clay or even modeling dough can be used. 1. Draw and cut out a pattern. It can be made out of paper if you're going to use it only once. Otherwise use an old plastic file folder, for example. 2. Roll out the clay on a surface covered with fabric, to approximately 8 mm (0.3-0.4 inch) thick. I put clay on fabric to prevent it from sticking to the table. Fabric also allows air through, which helps drying. 4. If your hamsa will have hanging parts, and also to hang it on a wall, make holes at this point. I use toothpicks and drinking straws (for bigger holes) for this purpose. 5. Decorate with beads or just make an ornament with the same material. 6. Let dry (it took about 2-3 days for this Keramikal hamsa to dry out, for instance). 7. This step depends on the clay you are using. You may need to fire your hamsa. Keramikal should be fired for 30 minutes at 170 Celsius. This would be different for another material, of course. 8. 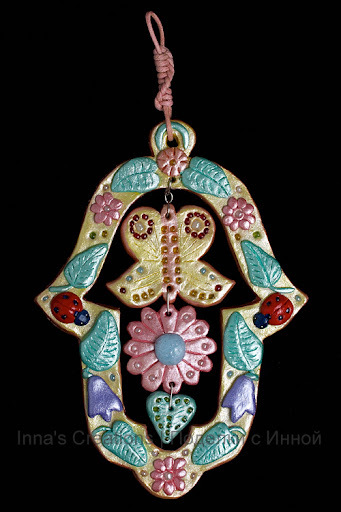 Color your hamsa and coat it with varnish if needed. As you can see, I used glitter paints to decorate this hamsa. Take a look also at this step-by-step tutorial on the Keramikal's site (Hebrew). And here are two hamsa's, I made earlier. Finally, you must see awesome hamsa's in Angela's Flickr album.